One of the great joys of summer is the appearance of juicy, ripe tomatoes in the marketplace. Tomatoes that, for once, actually taste like tomatoes! And, of course, think about tomatoes and you’ll immediately think about pasta. There’s something about fresh tomatoes and pasta that was just meant to be. Pesto alla trapanese makes for a nice variation on the classic summer pasta with fresh tomatoes and basil. This Sicilian cousin to pesto alla genovese. You will immediately recognize the family resemblance, of course, what with the presence of fresh basil, garlic and nuts (this time blanched almonds rather than pignolis). But true to its southern roots, this pesto stars abundant ripe tomato. NB: The main recipe in this post is for the easy-peasy modern version of this pesto. The more traditional mortar-and-pestle recipe, which actually produces a remarkably different dish from the same ingredients, is described in the Notes. 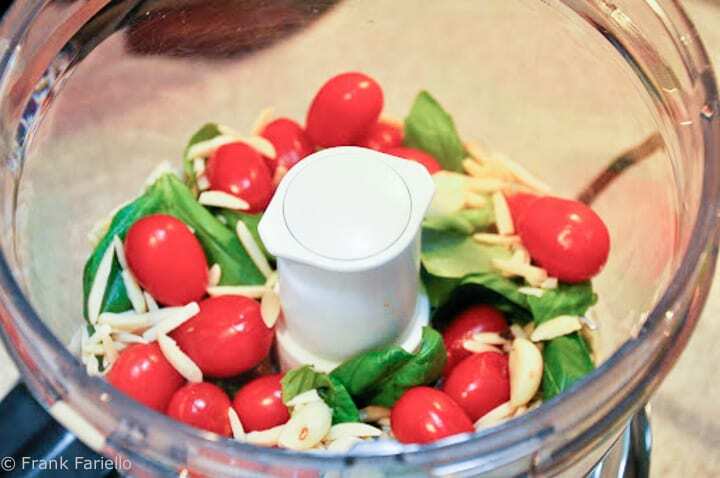 If using mature fresh tomatoes, you should peel them and remove the seeds before adding them to the food processor. Otherwise, your pesto will be too watery and have unpleasant bits of skin in it. Tomatoes are easily peel if the skin is loosened a bit by a quick blanch in boiling water (no more than 30 seconds or so) or by charring the skin over a flame as you would a bell pepper. You can also, as pictured below, use small grape or cherry tomatoes, which have tender skins and very little by way of seeds and water inside. They need no particular prep before they are added to the rest of the pesto. Blanched almonds are commonplace in US supermarkets (they are used extensively in baking here) but if you can’t find them, then take regular almonds, shell them and then blanch them for a few minutes. Their skins should then slip off easily. You want a nice, fruity, deep green kind of olive oil for this dish. This being a Sicilian dish, olive oil from Sicily would be perfect, of course, but they make similar olive oil in Puglia and that would certainly do quite fine, as would any similar olive oil from elsewhere. The traditional recipe for pesto alla trapanese using a mortar and pestle produces a rather different result—which is why many traditionally minded recipes will warn you never, even to use a blender or food processor to make pesto alla trapenese. You grind up the garlic with a bit of salt, then the almonds, then the basil, just as you would a traditional pesto alla genovese. The tomatoes is not ground up with the rest, but chopped into little cubes and mixed with the pesto. The texture is, of course, quite different: he tomato retains more of its original character and the pesto has considerably more chunkiness to it. And it looks quite different on the plate, with contrasting red and green bits. Nothing prevents you, of course, from mixing modern and traditional methods by making your pesto with a food processor but folding in hand-chopped tomato to it at the end. The traditional pasta for pesto alla trapanese is the home-made Sicilian pasta called busiati. But this pesto is delicious with linguine, spaghetti or even short pastas like penne or farfalle. In fact, if you ask me, it goes well with pretty much any pasta you feel like having. There are some variations to pesto alla trapanese that you can try at your leisure to see if you like. I’ve seen some recipes that call for a bit a red pepper which is actually quite nice. Others, call for topping your pasta with ricotta salata or fried bread crumbs rather than the pecorino—both very Sicilian touches. In summer a bit of mint along with the basil makes for a nice change of pace. Lovely recipe 🙂 Could you substitute pine nuts in place of almonds? I actually tried it last night with pine nuts and was amazing still! I’m not surprised. While every recipe I know calls for almonds, I would imagine that the dish would be perfectly delicious with pine nuts as well. this looks great, but i am super wimpy when it comes to heat/spice… i mean super wimpy. could i skip the pepperocinis/red pepper flakes? if so, is there a substitute that might work? Sure, of course. The dish isn’t supposed to be spicy, anyway—it should have just a hint of heat. Looks amazing, very hard to get good tomatoes over here in the UK, but next time I do I'll try this. Perfect summer recipe to use tomatoes and basil from my garden. Just made it for dinner tonight and I knew it would be good. Easy,tasty and will make it again. @shortyshawna: For this dish, at least, very little gear is needed. Just a pasta pot,a blender or food processor and, of course, a wooden spoon! MAGNIFICA RICETTA!!! La provero di sicuro! Grazie mille dalla mamma felice in cucina 🙂 ciao! I can't believe that I've never made my own pesto. Not sure why, but that is something I'll have to remedy. Your pasta looks like my idea of the perfect summer meal. Love it Frank! Oh this is perfect! Absolutely perfect! I am wondering how much gear do i need in my kitchen to reproduce these recepies?? Thanks, folks, for your wonderful comments! Special thanks to @Ann—glad I could bring back some fond memories and welcome to the site!!! I've read abou this pesto but never tried it. You've inspired me to do so now. Wow! I was lucky enough to live in Sicily for three years and that is perfect! Even your plates…. I'm now following you on Google Folllow! Love it! I heard of ricotta, walnuts and sundried tomatoes as a base for sicilian pesto, but this one with fresh tomatoes looks great! Question: why 400gms = 1/2 lb? wonderfull recipe! I will try it for sure!